The Zyxel PLA-401 Powerline follows the standard HomePlug AV directive, so you'll find this is a 200Mbps module that can be plugged directly into any 13-amp wall socket. Made from white plastic with a black strip highlighting the three LED lights, the Zyxel follows the standard approach of looking like a large wall thermostat. It may protrude from the wall, but it is narrow enough to plug into a twin wall socket and still allow a second device to be plugged in. The PLA-401 has been in circulation for close to two years now and in that time has been updated just once. Zyxel actually sent us two individual units, with one being the older V1 edition, while the second was the latest V2 edition. Both adapters look exactly the same, but the new version comes with reset and encryption buttons on the base, along with the single Ethernet port. The older PLA-401 V1 simply comes with the Ethernet port. Both use the same technology, so are interoperable. That said, you may need to update the firmware of older devices. Visit the website or use the Configuration Utility supplied with the adapters. You'll find the Configuration Utility on the supplied CD-ROM offers more than enough control to set up, run and manage your Homeplug network. This utility is also used to set up and run the encryption on the adapters. If you have two of the V2 adapters, you'll be able to do this using the hardware buttons. Once configured, you can set network priority to devices on the network. For example, you can set the machine hosting your music and movies to have a higher priority than your printer, for example. While this system is less sophisticated than the D-Link engine, for instance, it does offer a reasonable level of control. 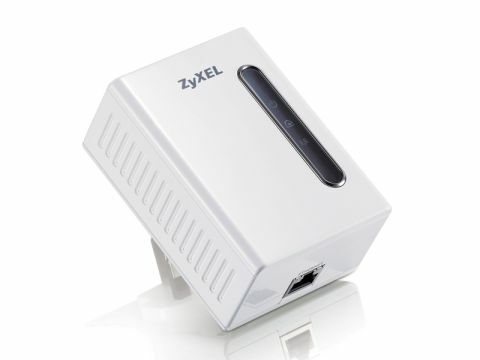 The Zyxel PLA-401 Powerline is a good all-round adapter that offers a fast and efficient service. However, we felt that first-time users may find the rather basic documentation and set-up controls a little off-putting.